Finally, when I could travel to Kerala (although for a much shorter duration than I’d planned), I was brimming with energy. When I finally got my first look at the landscape of Kovalam, I realised what a perfect tagline the Kerala tourism had chosen – God’s Own Country. The picturesque views, a long continuous strip of seemingly infinite coconut trees stretched beside the shore, the mesmerising beaches and varied experiences – it all looked like as if God had taken utmost care, time and brilliance to create this place! If you’ve been to Goa –India’s most popular getaway for never-ending parties and pure fun, you cannot help drawing comparisons between the two. At first, Kovalam seems like a twin sister of Goa. But as you begin to explore, it turns out that there are many unique aspects as well. Kovalam attracts more foreign travelers than people of our own (thanks to the many Ayurvedic resorts offering spas and Yoga sessions). The price of food are relatively high as in Goa, but liquor is expensive as against the prices in Goa. The crowd is not large as in Goa, and you can have secluded places for yourselves to enjoy along the sea shore. The beauty of Kovalam lies in catering to all types of travelers – whether you are looking for a break from the mundane life or you have arrived to have some fun, or you just want to do nothing. If you’ve traveled to Kovalam to escape from the otherwise stressful life temporarily, then head straight to numerous resorts that span along the beach side in Kovalam. There are resorts which offer you luxurious experience a keen to five-star hotels. These resorts have specialised people to provide Ayurvedic therapies and Spas. It will not only benefit the body but helps in uncluttering the mind and busts the stress. They have different packages for a fixed number of days ranging from 7-Days up to a month, based on the therapy you choose. Typically, the package would include food, accommodation and treatment costs. While the therapies or spas consume nearly half a day, the rest of the time is left to you to explore in and around. Resorts can be chosen according to your budget apparently. Although the top most popular ones are highly priced, there are some pretty good resorts which are economical too. A Quick Tip: It is recommended that you do a detailed research about the therapies and the resorts themselves before arriving. Also, it is better that you book them well in advance so that you could experience a perfect holiday! So, if it looks something interesting, then grab your favourite book and check in these resorts! If you want to hang out and see the places of interest, then hire a bike and head to places like Varkala – popular for its serene beaches and located about 60 km from Kovalam, Thiruvananthapuram – located about 15 km from Kovalam, Poovar Island – about 25 km. Kovalam beach itself is a famous beach known for its lighthouse on one side of the crescent and pristine and clear beach waters on the other end. You can just book a shack along the shore. Get dreamy gazing at the fantastic view of the sunset. Or watch the dance of waves against the cold breeze. Or you can get into the waters and swim along the giant waves and have some fun! Many of the restaurants are located just by the side of Kovalam beach. A walk along the crescent of the seashore will lead you to many shops as well. Some of the cafes are known for their bakery products while few restaurants are popular for their seafood. You can stroll along the beach after a heavy meal, even at late night since the entire street is open and lit until 11 PM. Poovar Island needs a special mention because of its breathtaking backwaters and sparsely populated, yet great islands. This place has sea spread across the length of the horizon on one side and has backwaters on the other. Small clusters of islands are sandwiched in between these, and the view is strikingly beautiful. 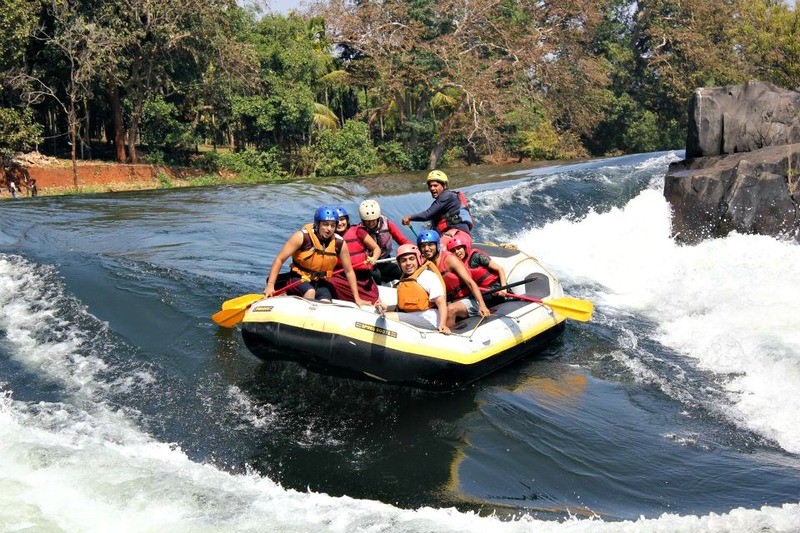 The journey on the boat amidst the waters is an electrifying experience where you get a fantastic panoramic view of the beaches, backwaters and the land together. Make sure you don’t miss this gem of a place when you visit Kovalam! If you are looking forward to some rush of adrenaline, then enrol for some surfing classes taught by some excellent local surfers. The proficient surfers take their profession seriously, but they ensure that you have loads of fun too. So, go there and learn surfing. It would mean having a gala time vacationing, plus picking up a new skill to flaunt! Apart from surfing, there are other water activities like motor boat rides, banana rides and the likes. Unravel that carefree spirit side of yours and soak in the adventure! One of the things that Kovalam is synonymous with is the Yoga. Almost every 4th home or a place displays a board stating ‘Yoga classes are held here’. If you want to go back feeling peaceful and refreshed, attend these classes and learn a thing or two about the asanas and their significance. You can also check some Kerala tourism packages for your travel!